With real estate prices always increasing, the dream of buying a home in Toronto can seem far-fetched for some. However many buyers are moving towards condos rather than single-family housing due to the significant price gap between the two housing options. Although we often hear of luxury penthouse condos selling for millions of dollars, there are plenty of condos that suit a smaller budget, and many new developments are catered towards those on a budget as well as the luxury buyer. Buyers on a lower budget must be willing to decide what they are willing to compromise on and what they are not – after all, you don’t want to buy a home that you don’t love. Often those on a lower budget may have to lose out on a parking spot, compromise on location and amenities, or opt for condos in older buildings. But lucky for budget buyers, Toronto has something for everyone. 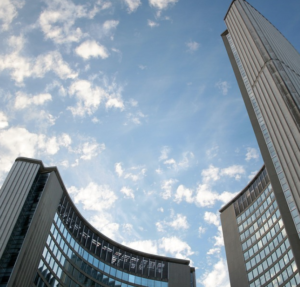 Read on to find out about five condo buildings in Toronto which are affordable. Malibu’s new condo development, Southside condos, is located at Wilson and Tippett in Clanton Park and should be ready for residents to move in by August next year. The development consists of two towers, one at 16 stories and the other at 17, housing 500 units. It offers buyers a more affordable option, with prices significantly lower than the average, without compromising too much. For example, residents benefit from great amenities including a concierge, fitness suite, lounge, party room, pool and yoga studio. The location is also extremely convenient, with both Wilson station and Yorkdale station close by as well as Yorkdale mall just four minutes away and several schools and parks in the area. Prices start in the high 190,000s for a 3studio – an excellent price for a brand new suite. One beds begin around $240,000, with two beds ranging from approximately $320,000 up to the low 500,000s for a 2.5-bed suite. Three beds start in the low 500,000s, increasing into the 600,000s for 3.5 beds. Parking will add an extra $35,000, and a locker will add $6,000 to the price. For those looking to buy a brand new condo at a more affordable price, Southside condos are definitely worth considering. Valhalla Town Square is an iconic new condo and townhouse development by Edilcan Development Corporation, located at 2 Gibbs Road. The development aims to create a community with stores, restaurants, and cafes alongside the residential suites. 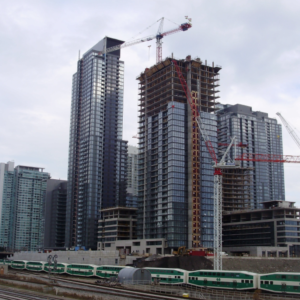 The 1480 condo units are spread over 43 floors and range in size from 400-1500 square feet. Residents can enjoy an array of amenities including a fitness suite, library, social lounges, yoga room, rooftop deck, pet spa, playground, and an express shuttle to the nearby subway. There is also an adjoining park and outdoor space, ideal for dog-walkers, children and anybody who enjoys a walk or picnic. Both the exterior and interior have a sleek and contemporary design, making the building visually pleasing both inside and out. Residents will also benefit from being close to shops, schools, hospitals, restaurants, parks and transit options. Prices start from just $593 per square foot and include a parking spot – bonus! Prices for one bed, one bath units are in the low 300,000s, significantly below average for a brand new apartment of this standard. Prices for two beds start in the low 400,000s, increasing to just over $500,000 for a 2.5 bedroom unit, and three beds begin in the low 500,000s range. This is an excellent price for everything that Valhalla Town Square has to offer. Edge on Triangle Park is a condo development by Urbancorp, bringing a touch of contemporary design to Lisgar Street in Toronto’s Little Portugal. The property offers serene tranquillity in the midst of bustling city life, making it a great place to call home. It consists of two 21-story towers housing 450 residential suites. The exterior has a clean and streamlined design while the interiors are beautifully designed with luxury finishes. Amenities include a bar, fitness room, party room, and terrace, and residents benefit from being close to cafes, shops, parks and galleries. Prices start from just $457 per square foot so buyers can expect to pay around $190,000-$260,000 for a one bed, between $220,000-$290,000 for 1.5 beds, and approximately $275,000 for a two bedroom unit. Parking adds an extra $25,000, and unfortunately, the biggest unit size is two bedrooms. However, Edge on Triangle Park is still a great option for singles, couples or small families looking to buy an affordable condo. VHL’s condo development, 2150 condos is located at Lawrence and Birchmount, bringing effortless style and grace to Wexford Maryvale. 2150 offers a traditional condo with modern finishes, providing a great home with desirable amenities for an affordable price. Amenities include a terrace, pool, hot tub, party room, fireplace, and fitness center, and residents can enjoy being close to cafes, bars, and restaurants. Prices begin at just $327 per square foot with 1-1.5 bedroom units in the low-mid 200,000s. Two bedroom units are in the low-mid 300,000s range with three beds in the mid-high 300,000s. 2150 condos provides an affordable option for those who enjoy a modern living space with desirable amenities. This condo development comes to us from David Mirvish in conjunction with world-renowned architect Frank Gehry and Great Gulf developers. The development is in the preconstruction stage and is located in King Street’s arts and entertainment district. The development consists of two towers at 82 and 92 stories, housing retail, commercial, cultural and educational spaces as well as plenty of residential units. The exterior is striking yet designed to fit in with the culture of the neighborhood. The interior will offer undeniable luxury and breathtaking city views due to the height of the towers. This development is still in the very early stages, so exact prices are not yet known. However, the 1950 units should offer something for everyone. What we do know is that whatever the price, these luxurious skyscrapers will be worth it. You can visit this link to know more about it. Is 2018 the Year to Buy Real Estate in Toronto?